It’s hard to keep track of all of the celebrity chefs these days. Between Alton Brown, Rachel Ray, the Pioneer Woman, Guy Fieri, and old greats like Emril, it’s easy to lose track of who each celebrity is and why they’re famous. Ming Tsai is different. For those who follow his show, he’s a relatable cooking expert who works tirelessly to bring innovative, easy recipes to your television screen. But what about Simply Ming’s cookware? Does Ming’s name bring the same no-nonsense accessibility and incredible kitchen performance? In order to find out how Ming’s celebrity endorsed ceramic non-stick cookware stacks up against the playing field, let’s dive into some detailed reviews. Simply Ming’s cookware line consists mostly of non-stick pots and pans that are targeted at the home chef. 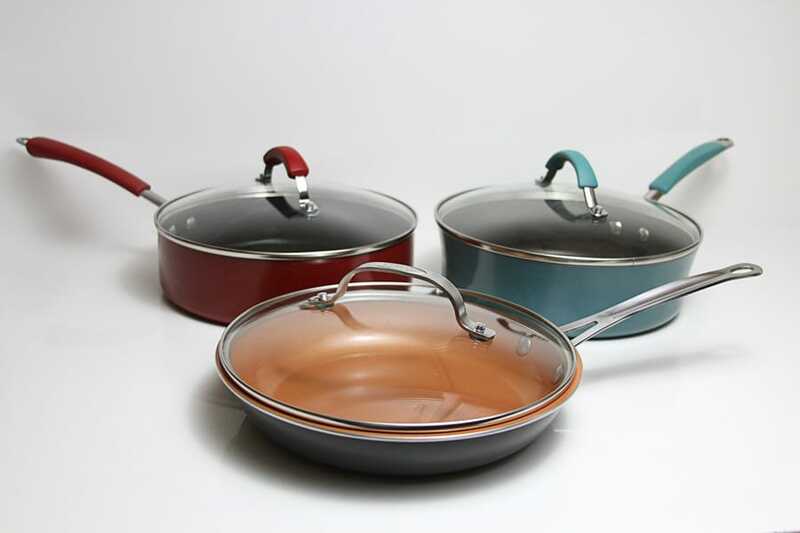 Cookware is sold both by the set and as individual pieces. Most sets come with a number of recipe cards from Ming that will give you lots of ideas in the kitchen. 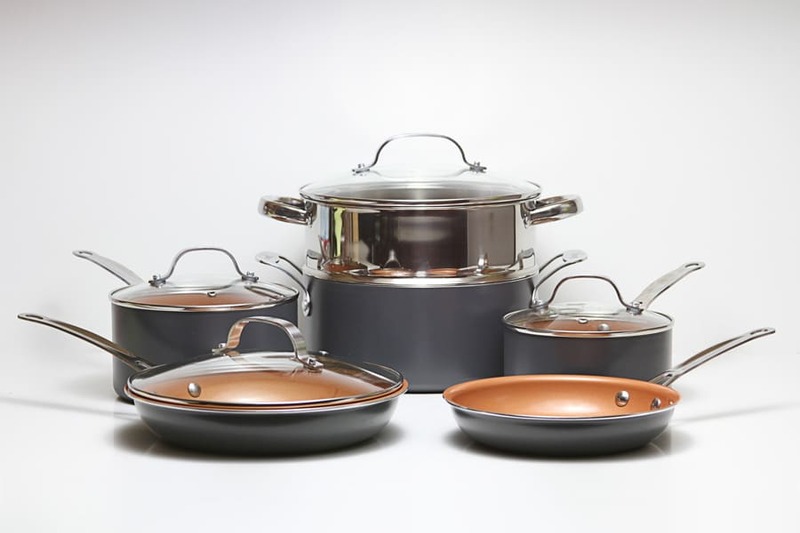 When you’re moving into a new kitchen, transitioning to an induction stove, or you really need to replace all of your old cookware, a big set like this is the best choice. Simply Ming’s 10-piece cookware set has five pots and pans, two utensils, and three lids, meaning you get all of the things you’ll need to start cooking, fast. It’s a modern, induction-ready non-stick set that’s made from aluminum with a safe and effective ceramic non-stick interior. Simply Ming’s cookware is easy on the eyes and easy to care for. The polished exteriors and vibrant copper interiors are technically dishwasher safe, although the manufacturer recommends that you hand-wash them. Each pot and pan is oven safe to 550 F, meaning you can start something on the stove and then finish it under the broiler. This is a pretty impressive feat for a non-stick set and suggests that Ming is using a high-quality, modern ceramic non-stick coating. The glass in the lids is less oven safe than the cookware itself — you’ll have to pull the lids out of the oven at temperatures above 420 F.
Most non-stick sets these days utilize the same basic construction ideas. This Simply Ming set doesn’t deviate a lot from the normal formula of an aluminum body for heat distribution and a steel disc for a bit more thermal weight and induction compatibility. These tried and true design features ensure that the set heats up quickly, stays hot when you add cold food, and remains compatible with all types of cooktops, including induction. Aluminum can get a bit of a bad rap in cookware, but it’s a very safe and effective material when used here. It does two important things: it provides a lightweight, inexpensive, and rigid structure for your cookware, and it helps transfer the heat from your stove quickly and evenly throughout each pot and pan. Aluminum is one of the best metals around when it comes to helping heat move quickly. Among cookware materials, it’s second only to copper, at helping your food heat up fast when you crank up the heat on the burner. The steel disk is important for a similar set of reasons. For one, while aluminum heats up very quickly, it also cools off quite quickly when you put something cold on it, like a piece of meat straight out of the fridge. This means you might preheat your pan, put some chicken on it, and watch the temperature plummet down several degrees as the cold chicken cools off the hot metal. Rather than force you to wait as your pan (quite briskly) warms back up, cookware manufacturers have started including steel discs in the bottom of their pans. Steel does a good job of retaining heat, ensuring your pan stays hot the whole time you cook with it. Steel also has another important role to play when it comes to induction. 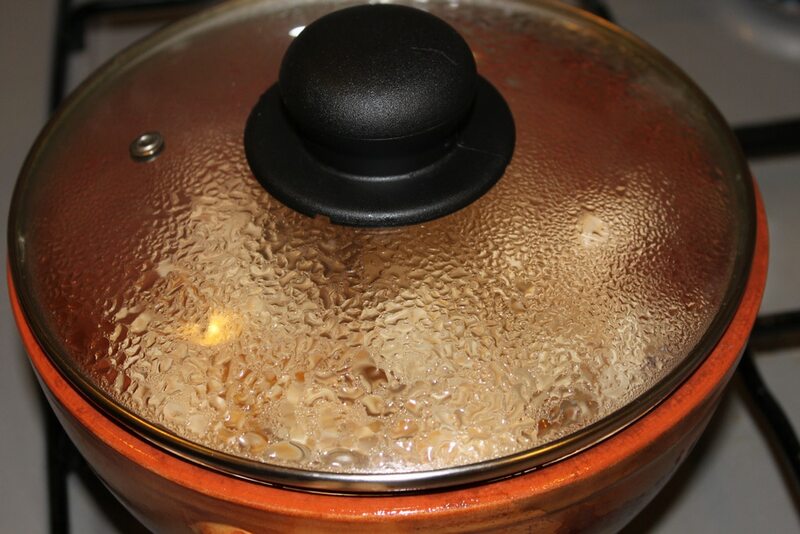 Induction ranges work by using magnets to jiggle molecules in your cookware really, really fast, which essentially generates heat directly inside of your pot or pan. 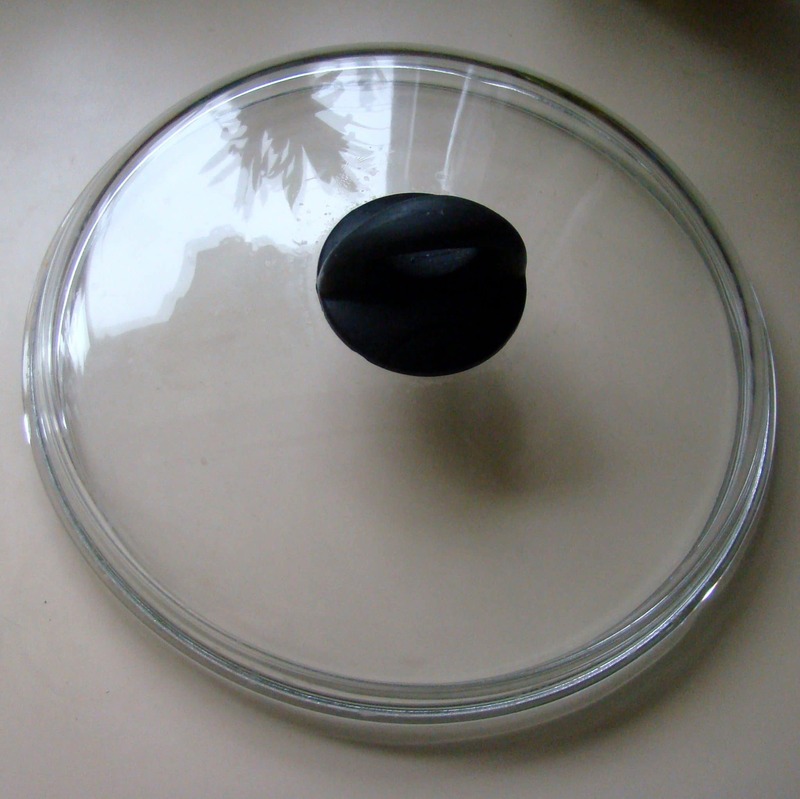 This process doesn’t work at all if your cookware isn’t magnetic. Since aluminum isn’t magnetic, companies like Simply Ming’s manufacturer put magnetic steel discs inside each pot and pan to allow this process to work. These features combine to ensure that this set is easy and fun to cook on. You can throw it on the burner and have a nice, hot surface to cook on in no time at all. It’ll boil water faster than a comparable set with stainless bottoms and is light enough to easily adjust while it’s on the stove. But what about food release? The non-stick ceramic surface of these pots and pans is made from a material called Technolon that’s nearly exclusive to Simply Ming cookware. It’s a safe material that serves as a protective barrier that prevents your food from coming into contact with aluminum directly. It’s also a very effective non-stick surface that will let you slide eggs and meat around like butter, at least at first. 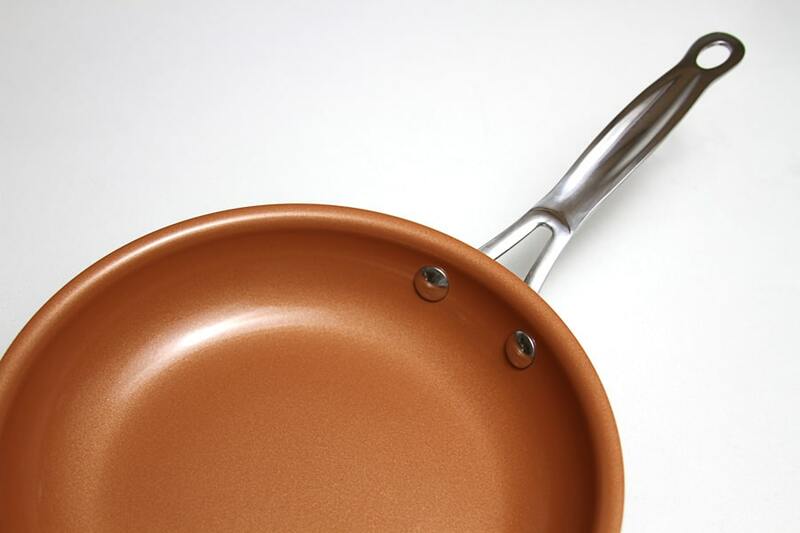 If you’re familiar with non-stick cookware, you probably know that some sets have interior coatings that flake off or wear out over time. What you might not know is that this description applies to ALL non-stick cookware. Every modern coating will wear out over the course of a couple years of casual kitchen use. Professional chefs have it even worse. They’ll often buy a new egg pan every couple of weeks in order to ensure that they can flip over a customer’s eggs every time with no hassles at all. That said, all non-sticks are not created equal. 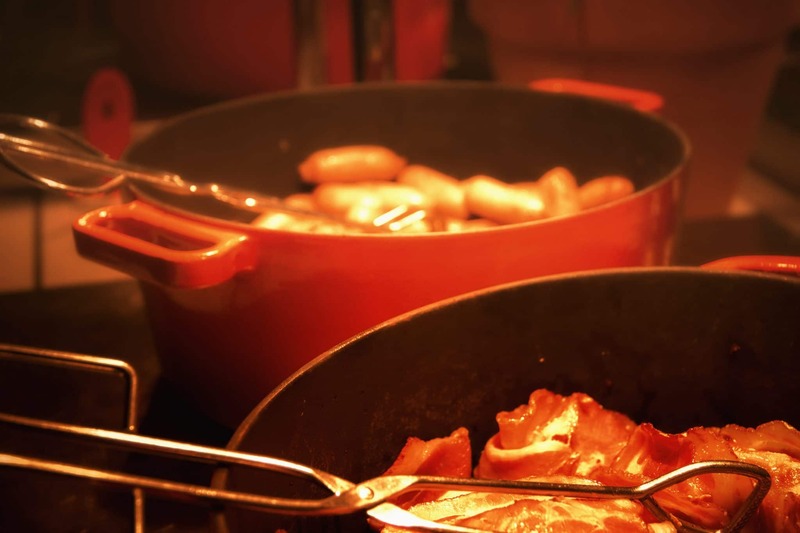 There’s certainly a range of lifetimes between cheap, low-quality nonstick coatings and nicer, high-end products that are designed to last as long as possible. Simply Ming’s ceramic seems remarkably average. While the manufacturer expects you to go through a surprisingly long list of steps in order to use this cookware properly, it does a pretty good job of holding up for a couple years with proper care. And yes, the food release is excellent the whole time. Ming has demonstrated many of these pots and pans himself on his television show. You can easily replicate any of his demonstrations on this set of pots and pans in your home. Each pot and pan has been carefully engineered to stand up to the rigors of actual home kitchen use, meaning you’ll have an excellent experience each time you fire up the stove. For me, the only real downside is the cost. Ming’s cookware isn’t unreasonably priced, but it is slightly more expensive than some non-stick cookware brands that are quite comparable. You could certainly make an argument for Ming’s carefully crafted pots and pans having better performance, durability, and looks than offerings from these cheaper brands, however, meaning that it’s a worthy choice for your primary cookware set. This 6-piece cookware set has a slightly different selection of pieces and is a different color than the set above. Otherwise, it’s quite similar: you get the same excellent performance, induction compatibility, and easy care. Personally, I would strongly recommend the 10-piece set above over this 6-piece cookware set. This is because of the pieces that are included. This set comes with a small 1.3-quart saucepan with no lid, meaning you cannot use it to make small servings of soup, rice, or pasta. Similarly, the square covered frying pan is helpful for casseroles, but its awkward shape makes it difficult to use on my range. I’d much rather have a set with a small covered pot and a round frying pan that won’t crowd out pots and pans on my other burners. That said, the quality is still excellent. This set has the added benefit of including 6 Ming Tsai recipe cards. It’s a perfectly acceptable option for anyone who prefers this particular assortment of cookware over the larger 10-piece set. If you’re like me and prefer covered pots and round frying pans, this 6-piece set might be more up your alloy. Again, it features an aluminum and steel design that works incredibly well on all cooktop types. You get two frying pans, one large lidded saucepan, and one large lidded casserole dish. This collection of pots and pans does a very good job of giving you a vessel for pretty much every cooking task. Like the set above, you get a set of 6 Ming Tsai recipe cards to use with your new pots and pans. One of the most popular Simply Ming cookware items, this non-stick wok is a great way to open up your kitchen to a variety of new Asian dishes. It’s large, deep, and fantastically non-stick, meaning you can stir-fry to your heart’s content and clean everything up with a single wipe of a sponge. Like the sets above, this wok is technically dishwasher safe, although the manufacturer recommends that you hand wash it when possible. While traditional woks are designed to be placed very close to a very hot flame, this cooking vessel is instead designed for a more modern kitchen. It’s got a flat bottom with embedded stainless steel that allows it to be used on induction cooktops and broad, sloping sides that let you keep choice ingredients farther away from the heat. It’s a great way to put yourself in the driver’s seat while you make dishes that combine multiple flavors and textures for maximum deliciousness. In other words, you should not get this product and expect it to behave like a traditional wok. Instead, it’s a tool that you can use at your leisure with a variety of recipes over more moderate heat settings. This should come as no surprise to most home chefs: after all, there aren’t very many recipe books that call for you to use a traditional flame-fired wok these days. This set includes a steamer as well as a wok. Steamers are one of my favorite go-to gadgets when it comes to preparing quick, easy meals. You can throw broccoli, asparagus, or even artichoke on a steamer for an effort-free vegetable or put in some mussels for incredibly delicious, easy seafood. The inclusion of this device helps to add another layer of usefulness to this already powerful stir-frying tool. Like the cookware sets above, this wok comes with a vented glass lid that lets you see what’s going on while you keep things hot. Using a lid isn’t just helpful when you use the steamer insert. It enables you to turn your wok into a multi-purpose cooking vessel that’s great for reducing liquids on the sloped sides. This means pan sauces and other dishes you want to thicken become incredibly easy. Overall, this Simply Ming non-stick wok is a solid choice for most home kitchens. You won’t be able to put it on an industrial strength gas burner and make authentic Chinese recipes, sure, but you’ll have a little bit more control over your stir-fried dishes. 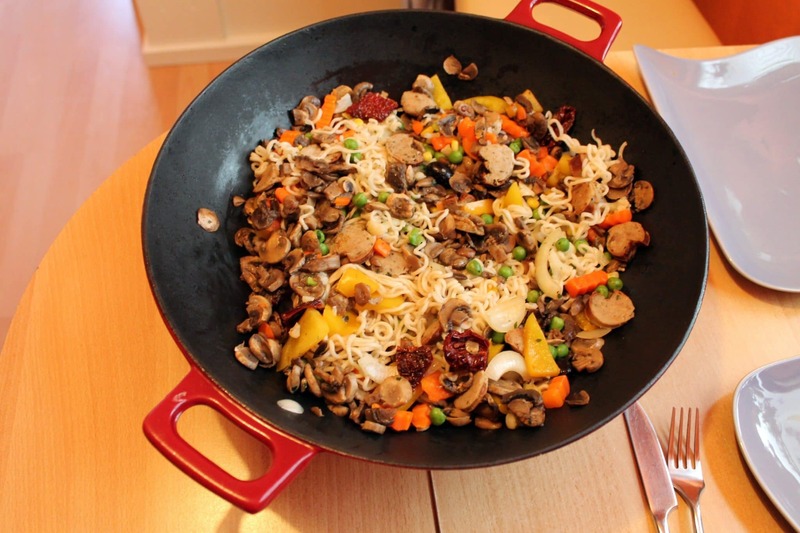 When you’re not stir-frying, you can use the wok as a versatile multi-cooker with the included lid and steamer insert. While Simply Ming isn’t the cheapest or most innovative cookware around, the solid design, helpful features, and excellent build quality help to make it a good choice in pretty much any kitchen. It rivals dedicated brands like GreenPan, Calphalon, and T-Fal in terms of quality and price. Your Simply Ming set won’t last as long as something like All-Clad, but that’s to be expected. For a very affordable price, you’ll get a good-looking, high-performance cookware set that will make lots of healthy, delicious meals.